“Approximately 5% from the sale of this product will be donated to support WWF’s global conservation efforts.Support an environmentally sustainable lifestyle and the World Wildlife Fund with these fun and educational games from Terra.2011 is the International Year or Forests. Declared by the United Nations General Assembly, the aim of this is to conserve and raise awareness on sustainable management and development of all types of forests in the world. It is vitally important for us to do our best to help protect and rebuild the world’s forest. Now, you can do so by buying FSC certified products like these great games. The wood in these toys is certified by the Forest Stewardship Council. This is the most trusted symbol for responsibly managed forests and signifies compliance with the highest social and environmental standards.Enjoy learning about and supporting the protection of the endangered species represented in these Wildlife Conservation Collection games while simultaneously promoting the conservation and protection of forests worldwide. Approximately 5% from the sale of this product will be donated to support WWF’s global conservation efforts.Discover some of Africa’s spectacular wildlife in this ageless game of chess. Sure to inspire a whole new generation of chess champions.This chess set will transport you to the Congo Basin: home to gorillas and bonobos, elephants and okapis, and of course the majestic lion. Like each game in the Wildlife Conservation Collection, the habitat featured in the design is under threat and action is needed to protect it.Enjoy playing the classic game of chess while learning about some of the most fascinating animals and habitats around the world. Features include: Recommende age: 6+ years. Number of players: 2. 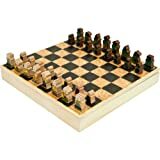 1 Wood chess board with removable lid measuring 10.25″ x 10.25″ x 10.5”.